An AC drive controls the application by continuously adjusting the motor speed. This results in reduced energy usage and prevents unnecessary wear of the equipment. 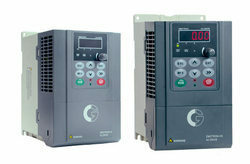 CGoffers a wide product range in the low voltage drives segment. Direct torque control and built-in shaft power monitoring are examples of premium features of AC drives. Direct torque control is considered an excellent method to control motor speed and torque and enables optimal usage of the motor.Our drives are also offered with active front end technology. This enables low harmonic operation as well as regeneration capability for energy saving. The shaft power monitoring reacts if the operation should deviate from selected load levels. Emotron VSB & VSS AC Drive is a multipurpose ac drive which is packed with features to meet application requirements. VSS is cost effective, easy to install, easy to use drive for the single phase supply system in challenging industrial environment. VSS series meets user’s needs and runs variety of applications like packaging, wood working, pumps, blowers, mixers and other machineries. It is ideal for machineries running on single phase supply, for better control and higher reliability. VSS drives are having host of features to meeting the demand for variety of applications. The sensorless vector control algorithm enables it to achieve speed control accuracy of upto 0.2% and starting torque of 180% at 0.25Hz. Rated as standard for heavy duty makes it ideal for demanding application needs. Features of VSS include programmable acceleration and deceleration curves, PID control, 16 programmable speeds, torque boost, DC brake, jog frequency, speed search, over excitation brake, torque control, separated V/f control and many more. This drive also brings with itself a host of readymade application macros which can simplify commissioning work and reduce the need for external controllers. In addition to logic functions like timers and comparators, VSS is having multi speed control, wobbulation control and length count functions. VSS is available in power ratings of 0.4kW to 2.2kW for single phase, 220V in IP20 design. VSB AC Drive will meet all of your standard requirements in this fast evolving world of automation. VSB will not only save energy but is also easy to operate, a quick fix for commissioning. Emotron VSB is cost effective, safe & energy efficient solution for the demanding industrial environment. VSB drives offers high level of reliability & productivity for process owners and is suitable for applications like fan, pump, blower, compressor etc. As standard Emotron VSB is rated for heavy duty and has built-in brakechopper meaning it is suitable for variety of industrial applications. With its multi-step frequency and variety of acceleration and deceleration curves VSB can be easily adapted to follow different speed profiles as per process requirement. The built-in potentiometer on the keypad makes it user friendly and eliminates the needs to external potentiometers thereby saving cost and improving reliability for the OEMs. Apart from hardwired communication, VSB also has Modbus 485 communication as standard enabling it to be controlled from plant control system. Designed to withstand 50⁰C ambient temperature and with its coated boards, VSB is ideal choice for tough industrial environments. VSB is available in power ratings of 0.75kW to 3.7kW for three phase, 380V – 480V in IP20 design. Emotron VSU AC drive is a dynamic drive for use in all industrial application where simplicity, reliability and productivity are required. Emotron VSU is an easy to connect, easy to configure and easy to install drive. Emotron VSU is general purpose drive for variable and constant torque application. With its V/f and sensorless vector control mode Emotron VSS is suitable for variety of applications like fan, pump, compressor, conveyor, crane, mixer and other similar machineries. As standard Emotron VSU is having coated board and has been designed to withstand 50⁰C ambient temperature making it suitable for withstand harsh industrial environments. Emotron VSU ensures safe and cost efficient operation of your demanding process applications. VSU is available in power ratings of 0.75kW to 18.5kW for three phase, 380V – 480V in IP20 design.